96" Tear Drop Style Used Pallet Racks Beams. We currently carry Used Tear Drop Beams varying from 51" to 153" lengths. Beams have varying degrees of weight capacities depending on length and thickness. We cannot guarantee weight capacities for used beams. 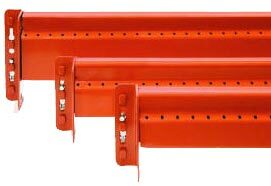 We recommend one piece Pallet Rack beams in excess of 108" in length incorporate an extra lateral support installed at mid span. When ordering please specify the length and the width needed for your particular pallet rack. Used beams are sold as is and colors may vary. We will attempt to send all matching racking per order. Specs: 96" length. Available in widths of 3", 3 1/2", 3 3/4" , 4" and 4 1/2". We recommend you contact us with the details of your project before ordering. CALL FOR PRICING and availability of other widths. Width: Please Select3"3 1/2"3 3/4"4"4 1/2"